Dr. Peter G. Ossorio was the creator and founder of the discipline of Descriptive Psychology, which offers precise and carefully articulated ways of speaking and thinking about persons, their behavior, and their worlds. He joined the faculty of the University of Colorado, Boulder in 1961, where he taught psychology for over 30 years. He was renowned as a teacher and clinical supervisor and directed over 50 dissertations at the University. His publications are extensive, and form the core conceptualization of Descriptive Psychology. It has given professionals around the world improved intellectual leverage to achieve advances in the fields of artificial intelligence, astronomy, business, computer science, education, psychology, spirituality, and elsewhere. He was invited to 18 US and foreign universities to share his discoveries and inventions. He also did cutting edge research through his various businesses, including the Linguistic Research Institute, Ellery Systems, and Global Commerce Systems. Dr. Ossorio was born in Los Angeles on May 4, 1926 and died at his home in Boulder on April 24, 2007. 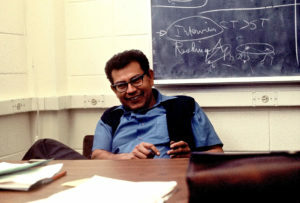 His papers are housed in the University of Colorado Boulder Libraries, Special Collections and Archives.